My etchings developed from my earlier landscape drawings and watercolors. I photographed and painted the shifting colors of the mountains and skies as clouds and storms moved across the horizon. After taking drawing and watercolor classes at Creative Arts Workshop in New Haven, CT, I turned to printmaking. I developed my etching skills to combine the fluidity of my wet-on-wet watercolors with the sharpness of my lines. 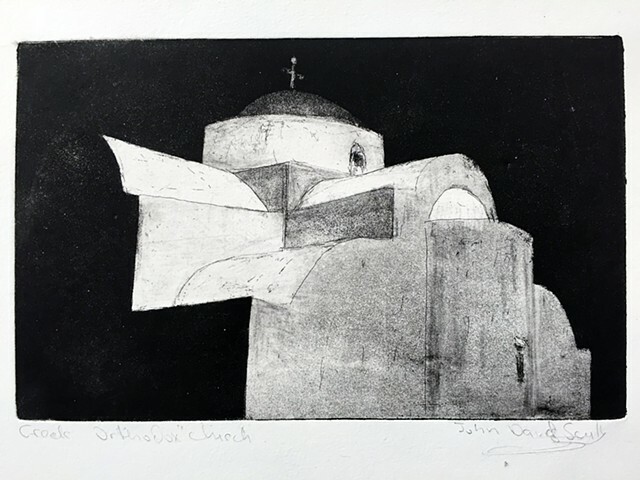 My prints are landscapes which sometimes include adobe churches, Greek Orthodox churches and Navaho-Hopi arbors. More recently, my imagery depicts scenes from photos taken on trips to New Hampshire, Greece, New Mexico, Newfoundland, Nova Scotia, Paris and Ireland. I have also been exploring images of Chinese mountains rising out of the clouds and the cliffs of West Rock in New Haven, CT.